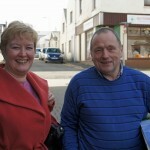 Scottish Labour’s candidate for Na h-Eileanan an Iar, Rhoda Grant, who has campaigned tirelessly for improved broadband services for almost a decade has said she is delighted that TalkTalk in Stornoway is now offering fibre broadband to customers. While she was MSP for the Highlands and Islands, Mrs Grant was contacted by a TalkTalk customer who was desperate for a fibre service as his neighbour was receiving a superfast service from BT. Mrs Grant took up the case and is pleased to be told that the customer has now had his order for fibre accepted by TalkTalk. Commenting, Rhoda Grant said “I am delighted that homes and businesses in Stornoway are finally getting to see improvement in broadband services, including a choice of supplier. “I was contacted recently by a very frustrated TalkTalk customer in Stornoway whose neighbour was accessing a superfast broadband service via BT yet he was struggling to get a service with his own supplier, TalkTalk, even though he could see the fibre cabinet outside his house. I have been in touch with TalkTalk over recent weeks and am delighted that fibre orders are now being accepted on their website.